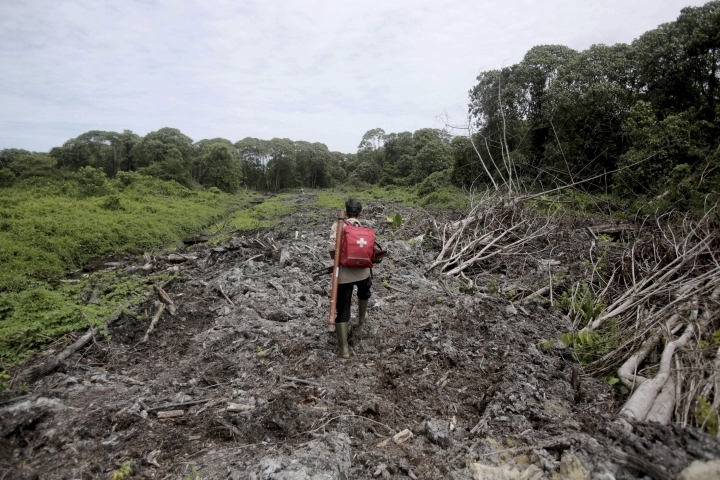 JAKARTA, Indonesia — Indonesian plantation companies fined for burning huge areas of land since 2009 have failed to pay hundreds of millions of dollars in penalties meant to hold them accountable for actions that took a devastating environmental and human toll. The 10 palm oil and pulp wood companies involved in fires owe more than $220 million in fines and the figure for unpaid penalties for environmental destruction swells to $1.3 billion when an illegal logging case from 2013 is included, according to separate summaries of the cases compiled by Greenpeace and the Ministry of Environment and Forestry. President Joko Widodo and other senior officials vowed action but repeated legal appeals by companies taken to court by the environment ministry have dragged the cases out for years. The ministry has issued statements trumpeted progress in sanctioning companies involved in land fires. But the two companies mentioned in those statements that have paid fines totaling $2 million involved environmental damage from open cast mining, not fires, the ministry's law enforcement director-general, Rasio Ridho Sani, told The Associated Press. Greenpeace Indonesia said the unpaid fines are money owed to the Indonesian people that could pay for large-scale forest restoration and for health and emergency infrastructure for when the fires strike again. "By not enforcing these laws the government is sending a dangerous message: company profit comes before law, clean air, health and forest protection," forests campaigner Arie Rompas said in a statement Friday. In a case that cited fires between 2009 and 2012, palm oil company Kallista Alam appealed its 336 billion rupiah ($24 million) fine all the way to the Supreme Court and then sought a judicial review of the Supreme Court decision against it. Fires intentionally set by the company in 2012 to clear land for palm oil tore through the Tripa peat swamp in Aceh on the island of Sumatra, killing wildlife including endangered Sumatran orangutans and blanketed surrounding areas in a thick haze. Tripa is part of the 2.6 million-hectare (6.4 million acre) Leuser national park, which is that last place on earth where endangered Sumatran orangutans, tigers, elephants and rhinos share the same wild environment. When the Supreme Court rejected Kallista Alam's judicial review, the company appeared to have exhausted all its legal options. But it avoided payment by getting a legal protection order last year from the Meulaboh district court in Aceh which is responsible for enforcing the fine, according to a ministry document that details the court's numerous instances of apparent non-cooperation in the case. The ministry said it has appealed the order to the Supreme Court. Activists who said they'd gathered 200,000 signatures on a petition against Kallista Alam, protested outside the Meulaboh court in January, media in Aceh reported. Kallista Alam couldn't be a contacted. The phone number listed for it in an online companies database is inactive. Sani, the environment ministry official, said in seven cases enforcement of fines is held up because the local courts responsible for enforcement and the companies involved haven't received copies of final rulings. "The Ministry of Environment and Forestry is consistent in making efforts in environmental law enforcement, including forest and land fires, by filing lawsuits in civil, criminal and administrative courts," he said. In a case from 2014, the ministry sought a 7.8 trillion rupiah ($553 million) fine for fires on 20,000 hectares of land controlled by Bumi Mekar Hijau, a pulp wood company that is part of Indonesia's Sinarmas conglomerate. A provincial court in 2016 imposed a far smaller than demanded fine of 78 billion ($5.5 million) but it remains unpaid. A spokeswoman for the Asia Pulp & Paper arm of Sinarmas, owned by one of Asia's richest families, said Bumi Mekar Hijau isn't contesting the 2016 High Court decision but is waiting for "the execution order and payment mechanism" from the court and environment ministry. "As citizens, if we don't pay our taxes we get sent to prison," said Rompas, the Greenpeace campaigner. "So why aren't the owners of these big companies being forced to pay what they owe or sent to prison if they don't pay?"